Leading Japanese flat knitting machinery manufacturer Shima Seiki, showcased its latest innovative technologies at last month’s ITMA Asia + CITME 2018 in Shanghai, just as China’s domestic knitwear manufacturing industry prepares for digitalisation and automation. Digitalisation and automation were key messages at ITMA Asia + CITME, which was held at the National Exhibition and Convention Centre (NECC) in Shanghai from 15-19 October 2018. Until fairly recently China was at the centre of the world’s knitwear exporting industry with its huge labour pool and low labour costs. Now with rising labour costs and labour shortages, things have slowed down a little and although China is still a very significant exporter of knitwear, it is smaller than it once was, with much production moving to Vietnam and Bangladesh. Accordingly, Shima’s Total Fashion System took centre stage in Shanghai. The Wakayama headquartered company’s solution is a complete digital system which aims to maximise profits while achieving zero inventory loss, zero leftover stock, zero lost sales opportunity and most importantly zero waste through smart, speedy and sustainable production. The automation part comes in the shape of the company’s WHOLEGARMENT knitting technology, a pioneering seam free knitting solution, which is now gaining real traction in the Chinese domestic market. Shima has been selling its flagship MACH2XS and MACH2S machines in significant numbers over the past three years, and a range of machines was on show in Shanghai, including a MACH2XS123 in gauge 15L and a MACH2S in 8 gauge. Also starring in Shanghai was the company's SDS-ONE APEX3 3D design system which sits at the core of the Total Fashion System concept. Highly realistic simulation capability on APEX3 allows virtual sampling which minimises the impact the sample-making process has on manufacturing, both in terms of time and cost. With Shima’s new manufacturing model, the production cycle can be shortened to such an extent, that on-demand production is possible avoiding the limitations of seasonal cycles. This allows the product planning stage to be extended to allow more accurate analysis of consumer demand. “Recent consumer trends, such as increased online shopping activity have changed supply chain requirements in China, with growing interest in on-demand production both in terms of time-compression and mass-customisation,” explained Masaki Karasuno, Head of Corporate Communications at Shima Seiki. Virtual samples can also be used at retail level to gauge consumer acceptance of upcoming products, data for which can be used for forecasting demand. “Such feedback can be used to adjust production and optimise inventory in order to prevent leftover stock that would otherwise go to waste. If stock runs out mid-season, on-demand production capability of Wholegarment knitting can furthermore replenish inventory to prevent lost opportunity,” Mr Karasuno said. 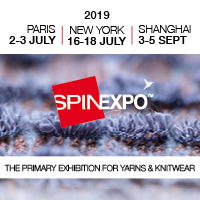 Shima showcased two collaborative projects which involve the generation and development of virtual yarns using the SDS ONE APEX3 Design System – the first with Italian spinner Tollegno and the second with Hong Kong’s UPW. Readers familiar with SDS ONE APEX3 will know of its capability in producing hyper-realistic digital simulations of knit structures – the software also allows users to scan lengths of yarn to use in knit simulations. UPW has made its entire collection available digitally on its website, which means that any designer or factory that uses the APEX3 is now able to download UPW shade cards directly into their design system and design with UPW yarns. As part of its Total Fashion System and to further support knit manufacturing in the 21st century, Shima has developed the world's first PLM (Product Lifecycle Management) system dedicated to flat knitting as a powerful implementation of IoT for realizing factory automation and this was in evidence in Shanghai. With Shima KnitPLM, the entire manufacturing process of knitwear from planning to production can be visualized to support efforts in maximizing production efficiency. “The fashion industry is undergoing rapid change in globalization and diversification, requiring even more variety, higher speeds and shorter cycles. In such an environment, in order to perceive consumer needs and realize sustainable growth, the capability to perform the process from marketing and product planning to production and sales, quickly and without waste, becomes very important,” Masaki Karasuno explained. Shima KnitPLM applies the latest IoT technology to join Shima Seiki products with its customers' ERP and SCM core systems, offering high levels of traceability and higher productivity throughout all stages in the value chain. With seamless linking of data between systems, workflow can be automated and labour can be reduced while reducing workload associated with data input required for each work stage. Shima exhibited a number of computerised flat knitting machines, the production tools of its Total Fashion System, each with distinct solutions for current and future needs of the Chinese and Asian markets. WHOLEGARMENT knitting technology was represented by three machines. The flagship MACH2XS WHOLEGARMENT machine has 4 needlebeds and Shima’s original SlideNeedle, which makes it ideal for producing WHOLEGARMENT knitwear in all needles. MACH2XS also features patented spring-type sinkers, which permits high quality knitting of complex fabrics – for example flechage is now easier to knit, allowing more control over neck drop. As the ‘MACH’ name suggests, speed and productivity are high, with MACH2XS achieving a maximum knitting speed of 1.6 metres per second. Additionally, the machine’s R2CARRIAGE system permits quick carriage returns for high efficiency per knitted course. Split Stitch technique also allows efficient production by eliminating empty courses and quality is assured with i-DSCS+DTC Digital Stitch Control System with Intelligence and Dynamic Tension Control. MACH2XS is designed to offer flexibility for knitting beautiful and sophisticated, high-quality WHOLEGARMENT products in all needles, with a wide variety of knit patterns at very high speed and efficiency. MACH2XS was on show in gauge 15L. MACH2S is a versatile V-bed machine that supports production ranging from conventional shaped knitting in all needles to WHOLEGARMENT knitting using every other needle. At ITMA Asia + CITME, the MACH2S was shown in 8 gauge for coarse gauge applications. Shima is currently experiencing a spike in demand for its flagship MACH2XS machine, especially in China, which is affecting delivery times. The company is now offering MACH2S as an alternative for Chinese and other manufacturers. The third category of WHOLEGARMENT machine on display was the machine range known as ‘Mini’. The SWG061N2 compact or ‘Mini’ WHOLEGARMENT knitting machine is capable of producing a wide variety of knit accessories for fashion as well as technical textile applications. The SWG061N2 on show in Shanghai was producing novel 3D shoes in 15 gauge and an extensive range of samples was also exhibited. For more conventional solutions, Shima’s SVR series is a very popular choice for shaped knitting. On show was the company’s SVR123SP computerised knitting machine in 14 gauge, featuring a special loop presser bed, capable of producing hybrid inlay fabrics that feature both knit and weave characteristics. Demand for such unique fabrics are reported to be very high across a wide range of applications - from fashion to sportswear, innerwear, outerwear, uniforms and other functional clothing, as well as wearable technology and technical textiles. The SVR123SP shown in Shanghai also featured Shima’s i-Plating option for expanded capability in inverse plating technique where complex jacquard-like patterns can be knitted in plain jersey stitch. Knitted accessory items were also shown to demonstrate the flexibility of the technology. ITMA ASIA + CITME was deemed a very successful show for Shima, who reported high visitor numbers and strong sales at the event. The exhibition hosted over 1,600 exhibitors and attracted around 100,000 visitors.